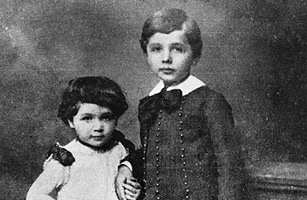 A childhood portrait of Albert Einstein and his sister Maja. Einstein was slow in learning how to speak. His parents even consulted a doctor. He also had a cheeky rebelliousness toward authority, which led one headmaster to expel him and another to amuse history by saying that he would never amount to much. But these traits helped make him a genius. His cocky contempt for authority led him to question conventional wisdom. His slow verbal development made him curious about ordinary things  such as space and time  that most adults take for granted. His father gave him a compass at age five, and he puzzled over the nature of a magnetic field for the rest of his life. And he tended to think in pictures rather than words. See photos of the lighter side of Albert Einstein.